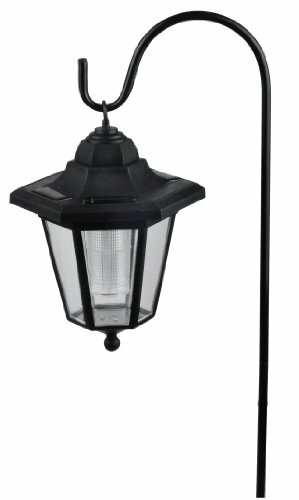 Our Solar Hanging Coach Lamps / Path Lights add atmosphere to any outdoor space. Powered by an internal LED and solar cell at the lamp's top, the lamp's internal LED uses a reflector to increase brightness. Designed as either a hanging tree lamp or as a traditional path light when using the included ground stakes. Sized with a diameter of 6.25" in length and 8.5" height, the lamp hangs below a 3" stainless steel hanger when used as a tree lamp. Alternatively, the included 24" ground stakes can be used when placing the lamps near paths, flower beds, spas and pools. Packaged as a set of two (2) lamps per box. Expect 6+ hours of performance with good direct sunlight exposure. Since performance is directly related to the amount of sunlight received on the solar panel, place the lamps in an optimum location for best results. Packaged with a set of decorative stainless steel hooks for use in hanging the lamps from branches and trees. Solar powered with a 600 mAH internal NiMH battery. Turns on automatically as dusk. Internal reflector for brighter LED lighting. Includes ground stakes for use as path lighting. Beautifies your yard, garden and trees. If you have any questions about this product by SolarStrings.com, contact us by completing and submitting the form below. If you are looking for a specif part number, please include it with your message.